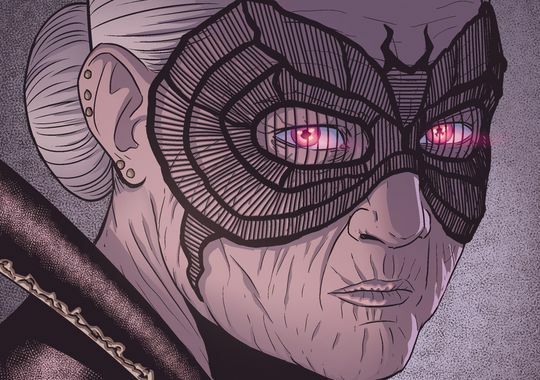 I don’t know about you, but waiting four whole weeks for a new issue of The Wicked + The Divine, after that cliffhanger ending of the first issue, was quite the stretch for me. Thankfully this issue is worth the wait and continues to draw readers into the world of the re-born deities. Building on last month’s freight train of a first issue, The Wicked + The Divine 2 is easily the best thing you’ll read this week. Be aware there are plot details below, along with some theorising on what is going on. There’s a lot of detail to pick up on in the art of the issue, much like the last instalment. On the very first page we have the Godwheel, as I’m calling it, confirming that Luci’s icon is the inverted pentagram, now behind bars. If they’re mentioned in the issue, then they’re deemed “in play” and their icon is revealed on the Godwheel. 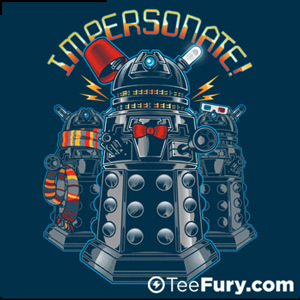 From this it’s a simple matter to work out who’s who as we go round. Currently shown are: Amaterasu, Lucifer, Sakhmet, Minerva, Woden, The Morrigan, Inanna, Tara and Baal. By issue’s end we’ll see another god revealed and their icon appropriately embellished. Picking up mere moments after Luci’s hearing has been abruptly halted, as tends to be the case when the judge’s head explodes; we’re brought back to Laura’s point of view. This second issue features much more of Laura. While the first issue had her as a spectator for the most part, here she’s a participant, which is no bad thing given how the première of The Wicked + The Divine was really Luci’s show rather than Laura’s. Laura overhears Luci asking Amaterasu for help and decides to step in herself. Looking back at the panel more carefully, I’d suggest Luci is more than aware Laura can hear her, and what she says is for HER benefit, not Amaterasu’s. Remember that panel of Luci offering her hand to Laura after Amaterasu’s gig in issue 1? Luci’s playing her own game, and Laura’s her pawn. It’s nice to see that the avatar may change to fit the times, but no matter when you are; Lucifer is still Lucifer. 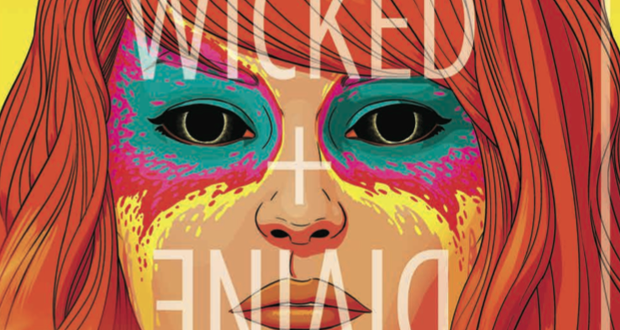 Issue 2 off The Wicked + The Divine is a less frenetic pace than the premier, but still crams a lot into its’ pages. One significant development is the fleshing out of Laura so that she feels more than just a cipher for the reader. We see inside her home and briefly meet her parents and sister. Laura uses her phone to try and find out what Luci’s cryptic message from the courtroom means, while the family watches Baal in a fiery televised interview. In true South London style, her iPhone has a cracked screen. Like the other members of the pantheon, Baal is visually an amalgam of several celebrities, in this case there’s some Tinie Tempah there and a touch of Kanye, I believe. When she visits Luci at the prison a week later, Laura’s style is markedly different to that of the first issue. Eschewing the makeup, jewellery and diaphanous dresses of Amaterasu’s fans, she’s now wearing black trousers and a dress shirt buttoned up to the top. 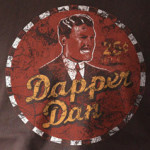 Laura has a new idol, and this one wears shirts. I might be wrong, but by having Laura adopt elements of Luci’s style, I feel the team of The Wicked + The Divine are showing us the fickle nature of teenagers. We all had our flavours of the month, and our allegiances were often as changeable as the weather. There’s also a rather fatalistic monologue from her about how her future is godhood and so exams are irrelevant. Oh the folly of youth. Just as last issue, Laura serves as the reader’s point of view in receiving some exposition from Luci. Here in the prison with Luci behind a glass cell that’d make Hannibal Lecter jealous, Laura, and we, are told who Ananke is. My natural suspicion says that what we are only hearing what Luci wants us to hear, but as yet I don’t know what she has to gain from obfuscating the truth. The prison scene has the same swagger as last month’s Luci, but there’s an interesting show of vulnerability too. Remember that the gods in The Wicked + The Divine are teenagers and for all their power, they are still midway between childhood and adulthood. Finding your way when you’re a mere mortal is tough; imagine trying to do that when you’re a god. While Laura has been portrayed as a fervent believer, the journalist from last issue is a stark contrast. Cassandra is a sceptic and we find out a little about why she feels this way. 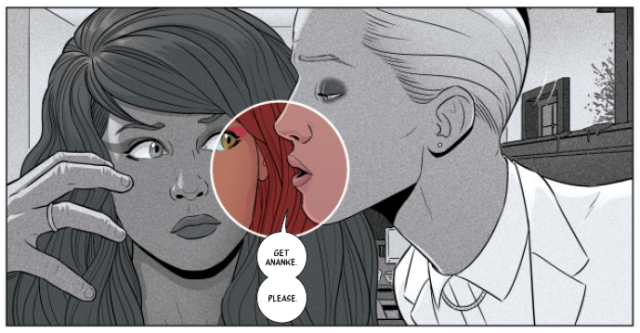 (Oh and for those of you poring over the pages looking for clues, Google “The Cassandra Metaphor”, it might be relevant…) Although she might be cynical about the pantheon, Cassandra is quick to start seeing a conspiracy in Luci’s case and the mysterious Ananke. Again in the book we get an inner comment form Laura being disparaging about Tara. We’ve yet to see Tara, but Laura clearly dislikes her and I’m very curious to find out why. I’m inclined to think it’s someone she knew before they became a god. The next few pages have some very cool artwork from McKelvie. The Wicked + The Divine is already a higher page count per issue than books from the Big 2 publishers, but even with an increased page count, I can’t imagine an editor letting Gillen & McKelvie use 4 pages just to show a character get from street to platform level at an underground station. 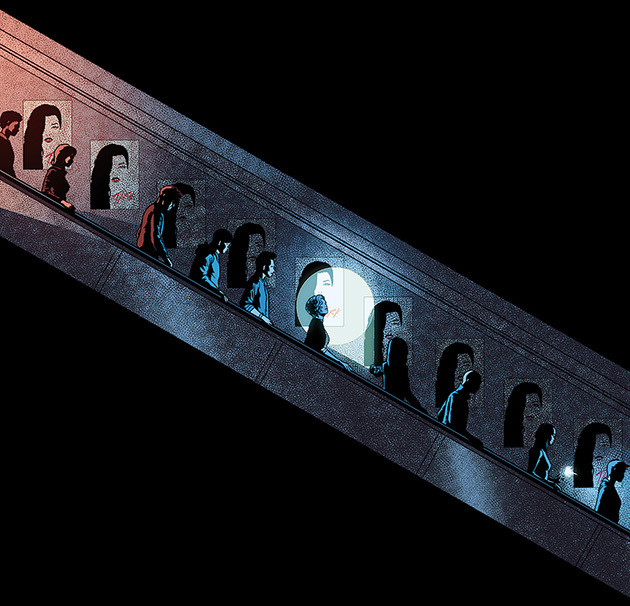 Travelling in silence from street to platform, Laura enters a station and descends into the underworld. The heavy use of black to cover those sections of the page that aren’t in use is doubly effective when you realise Laura is going to visit The Morrigan. NONE MORE GOTH etc. More inner dialogue from Laura gives us a bit more insight into the pantheon as well as Laura’s own feelings about The Morrigan. While she compares the other gods to pop stars, The Morrigan is likened to being underground, which is essentially where you’ll find Goth music nowadays. You’re hardly likely to get a Sisters Of Mercy comeback tour on MTV. Maybe it’s just me, but did anyone else start humming Girls Aloud – Sound Of The Underground as they read Laura in the station? 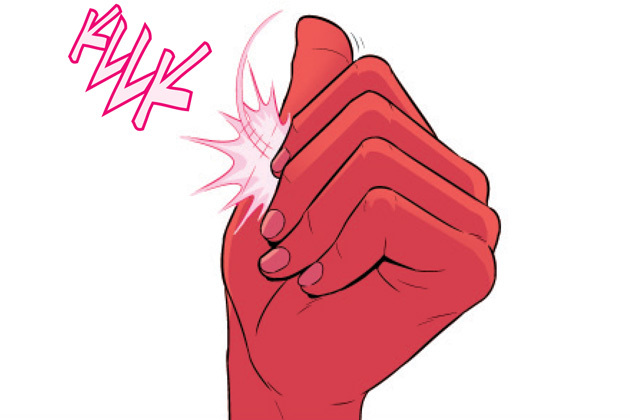 As is now typical in a Gillen/McKelvie tip, music is key, whether it’s being played in the scene or not. What do we learn here? Goth is underground. Still. 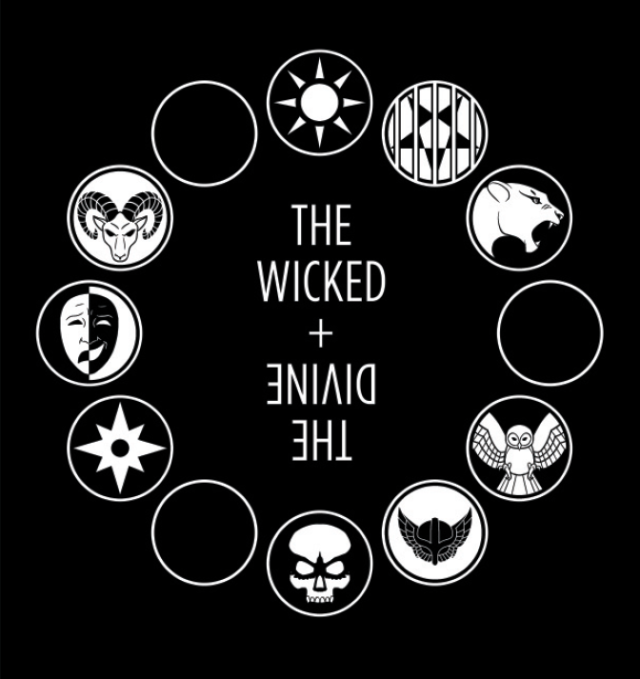 As with issue 1, The Wicked & The Divine 2 has a hell of a cliffhanger and one I’m unwilling to spoil here, but as I mentioned earlier, the Godwheel is shown again, this time with another icon revealed. The ensemble work here continues to impress; from Gillen’s scripting, to McKelvie’s art, to Hollingsworth’s colours, everyone here is doing stellar work. While issue 2 might have a slower pace than 1, it still manages to cover significantly more ground than your average monthly title. There’s no padding, there’s no filler. It all feels necessary and relevant to the whole. If they can keep up this quality of work, you’ll be seeing this on many reviewers Comic Of The Year lists. I’m going to give The Wicked + The Divine 2 a full 5 snaps out of 5, as it escapes the dreaded sophomore slump many books suffer in their second issue and continues to raise the bar on monthly storytelling. Good work, Team WicDiv!